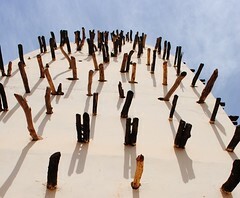 Four stories high, looking over the fantastically green city of Brikama in The Gambia, Jaliba’s house was indeed beautiful and we had turned up unannounced and uninvited, expecting at best a cup of tea and a chat. But as we rolled our bicycles into the driveway we were greeted with a scene of busy women smiling up at us and welcoming us to their compound. They quickly informed us that Jaliba was out, and that we must wait for him over a large bowl of Maffe. After attempting to finish the meal that could have fed six, we watched on as the women forced a kora onto the youngest of Jaliba’s sons, Jaliba junior. But little Jaliba, only interested in Imran’s guitar, grabbed it and held it like a kora announcing simply that he too wanted a ‘toubab kora’. We laughed and discussed the certainty of his musical career, owing to his strong griot lineage. It wasn’t long before Jaliba arrived home to find us, the mystery cyclists, stood on his doorstep. Feeling a little sheepish we introduced ourselves and the project ‘music cycles’. Jaliba in his gentle manner insisted that we come along to a few of his gigs and stay at least one night with the family. Later as we sat watching the band tune up, begginning to feel the birth of a street party atmosphere build, Jaliba told us of how frequently he plays for baptisms and weddings. 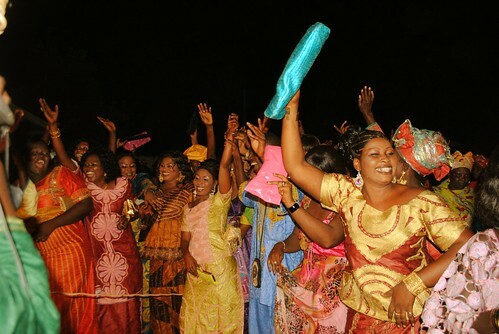 The attendees of the baptism arrived in their hundreds, women in elaborate dresses, their sequins and bold prints owning the dusk air. Intrigued by the sound of drumming and saxophone we strolled around the corner to find a group of 30 or so singing, dancing and clapping to the rythmic beat of the drummers accompanied by a pentatonic saxophone line. We stood back in awe of the scene in front of us. Before we knew it Mikaela had been grabbed enthusiastically and now stood in the centre of the circle of women, clapping her on, determined that she would dance. 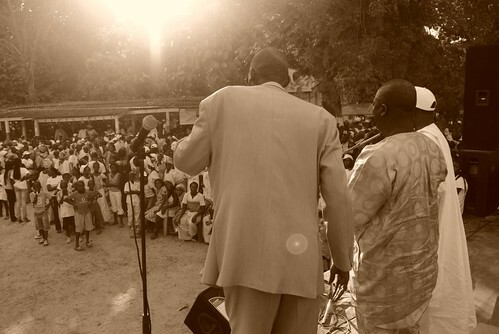 The crowd swelled and flowed moving us back towards Jaliba’s band who had now started to play. 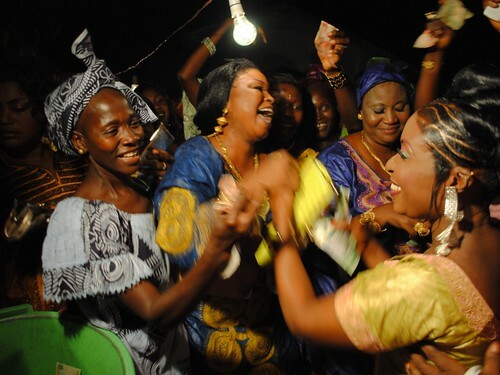 The crowd went wild, the women moving forwards to dance as the men took a step back to witness the energetic raising of the purses high above their elaborate hairstyles; hairpieces, painted scalps, head ties, a mass of bold colours and sparkling beads. 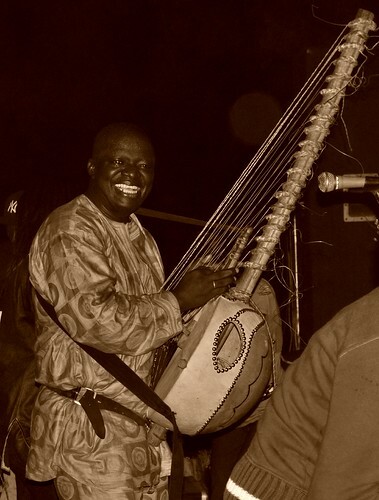 Jaliba has been performing in and around the Gambia for more than 20 years and he has achieved true celebrity status. 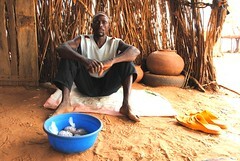 Jaliba is a griot, and as a griot he has an important role to play in society. “[Griots] are mediators, they connect people and they are the most vocal people in society”, he explains. Historically, griots were the closest advisors of kings and were the holders of historical knowlege and lineage. “Today our role is lighter’ he says simply, ‘today we are less linked to politicians and more connected to the people’. In a country where only 20% of the population can read government campaign posters on issues such as AIDS and Malaria, it’s no suprise that Jaliba’s topical lyrics run deeper that a Baptism celebration. 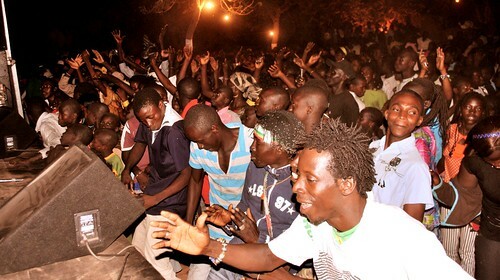 At a political rally in Sedhiou in the Casamance region of Senegal, we find ourselves once again in front of an enourmous crowd of Jaliba fans. This time though they are attendees of a political rally. As we look into the crowd we are faced with an audience of t-shirts bearing the faces of bored looking politicians with promising slogans. Worn with little enthusiam but for the fact they are distributed for free, the crowd becomes disinterested in the dullness of the political speeches and race for Jaliba’s stage. The women rush to the front, the faces on the t-shirts are forgotten and the dancing begins. ‘I sort of preach’ he tells us later. 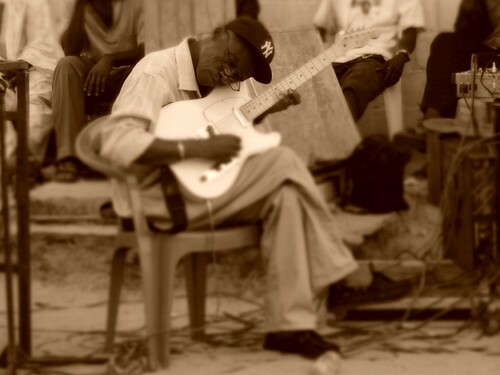 Jaliba laughs as he tells us that in the beginning of his career the griots turned away from his music. 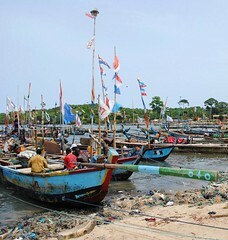 Now though, that pressure is in the past and Jaliba’s popularity could not be stronger in both The Gambia and Senegal. Now a UNICEF Goodwill Ambassador Jaliba is an established public figure here, his words are trusted by the people who follow his music and for some his lyrics educating people on HIV/AIDS, may be their only source of information. They lean through the windows of his car as they chant his lyrics about malaria prevention loudly, smiles beaming, jumping at the car just to get a glimpse. Back at home Jaliba’s family once again welcome us. We have stayed far longer than planned but by now Mikaela has developed some kind of epic cold involving multiple sneezing, constant nose blowing and a voice like a tired camel. One of Jaliba’s wives Fatu, orders her to bed for a day where she is waited on by the children of the house as Fatu fusses over whether the quantity of cornflakes will be enough for our breakfast. In the evening we try to play some of our songs to Jaliba, but with Mikaela struggling to sing and creating Janis Joplin-like sounds, we focused on guitar and kora. 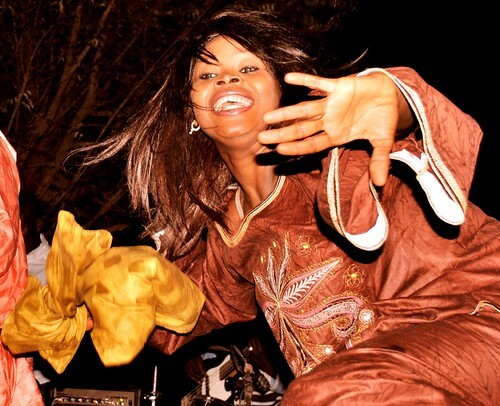 The growl of Jaliba’s deep voice dances over the gentle sound of the strings and we are all lulled into a relaxed state for a perfect evening of conversation and hot goat stew. The following day we once again find ourselves saying a reluctant goodbye to friends we will not see for some time. Jaliba turns to us and with a warm smile states, ‘I will miss you both’. We tell him how sad we are to leave and that we now feel part of the family. 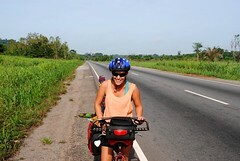 Concerned we will be tempted to stay longer we make a quick exit and cycle away down the sand piste to cross the border into the lush green of Casamance, Senegal. We love to cycle, otherwise we would not be cycling thousands of kilometres. However we are but man, and man must laze, eat and laze some more. And laze we have done, though it’s fair to say we have invested in our musical time here in Essaouira. Everyone here is a musician and taking time to hear what everyone has to offer has been worthwhile. 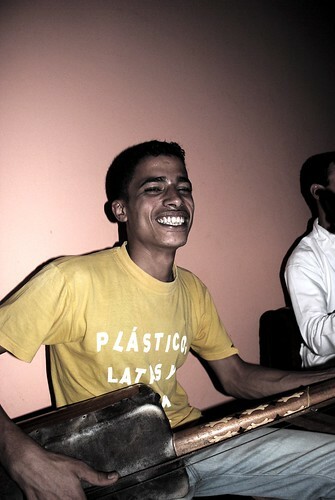 Take Ibrahim; a twenty something gimbri player who works in a music shop by day and plays Gnawa music by night. Ibrahim made time for us, was patient with Imran as he showed him the ropes of Krakeb playing and was keen to share his love of music. Until we met Ibrahim our short time in Essaouira had brought us to be pessimists, verging on snobs. Until we reached Essaouira, we had grown accustomed to being the only tourists in town and we found the crowds of mini-skirt parading tourists undignified. 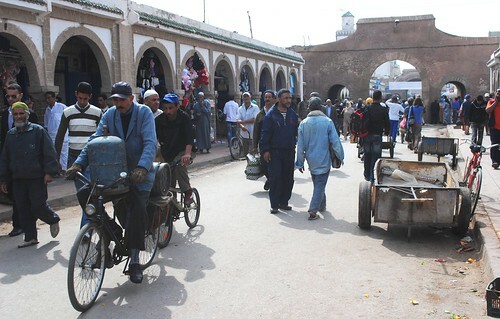 However, Essaouira wisely taught us a lesson, not to judge too sharply and to keep our eyes open. 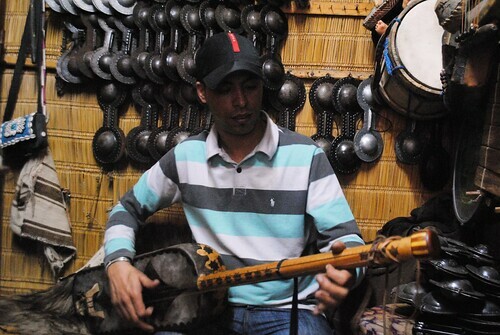 It does seem strange that it would take a banjo for us to fully warm to Essaouira. 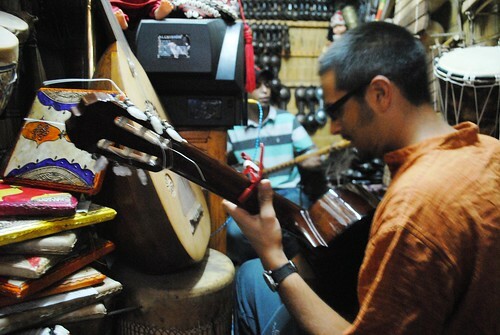 But it has indeed been the banjo Berbère that brought us to enjoy a Moroccan jam session. After playing music and meeting various musicians around the small city we were packing our bags to leave. But in the time it took for a handful of photos to be printed we had been introduced to half a band; waiters by day and musicians by night. True to the Moroccan spirit we were invited to rest in a quiet lounge style room with low lying couches in deep reds and gold- within a few minutes we were sipping tea and listening to the sound of the gimbri once again. 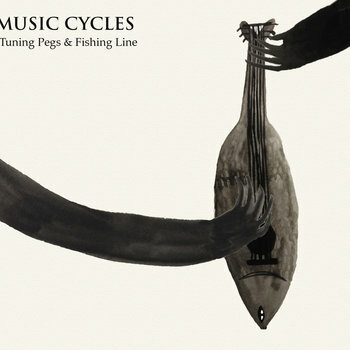 But this time the feel of the music was transformed by the resonating sound of the 4 string banjo and a gimbri. We had seen banjos for sale in various music shops but remained unenlightened as to why there presence here seemed so strong. 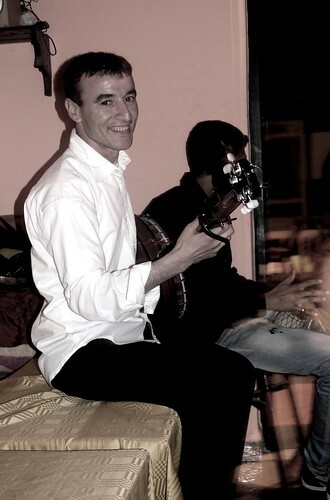 Here the banjo is creatively played as a lotar style instrument. The lotar is a 4-string lute with a hollow tear-drop shaped carved body. 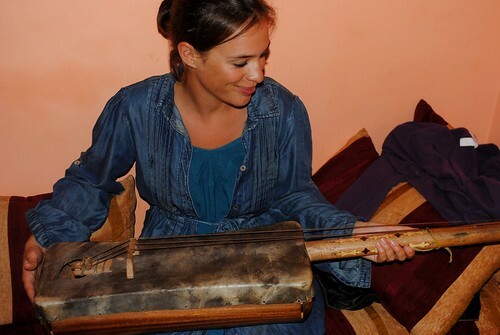 Unique to musicians in the regions of the High Atlas Mountains of southwestern Morocco, it has a similar tone to the banjo. 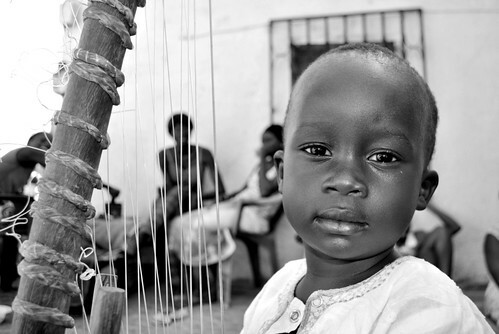 This is not a concidence, as some banjo enthusiasts or ethnomusicologists will already know that the banjo, gimbri and lotar can all trace their ancestry to the West-African ngoni. Seing the banjo played alongside its cousin, the gimbri, was uncanny. As they finished work the musicians around us grew in number, occasionally running away from a tune to serve a customer. We were encouraged warmly to join in and with such a supportive environment both of us felt at home.